This model is discontinued. 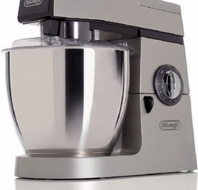 As an alternative, we recommend the Delonghi DSM7 7 Qt. Stand Mixer. LARGE 7-QUART STAINLESS STEEL BOWL. BONUS 1.2-LITER (40-OUNCE) GLASS BLENDER INCLUDED. HINGED SPLASH GUARD allows you to easily add ingredients. OVERLOAD PROTECTION DEVICE The unit will automatically terminate operation if the capacityexceeds the suggested amount. UNIQUE MIXING ACTION The contrary motion of the beater and the beater socket, resultsin thorough and perfect mixing results every time. DIE-CAST ALUMINUM BODY AND COMPONENTS combine for optimum quality and durability.